Humans excrete a nitrogenous waste, uric acid. It is the product of nucleic acid, not a protein of the metabolism. Uric acid is the end metabolism product of purine, purine being the nitrogen-containing compound that occurs in nucleic acid. Confusion arises between the purine and protein, but they're a dissimilar chemical structure entirely. Even so, most foods that contain protein, also possess purines. 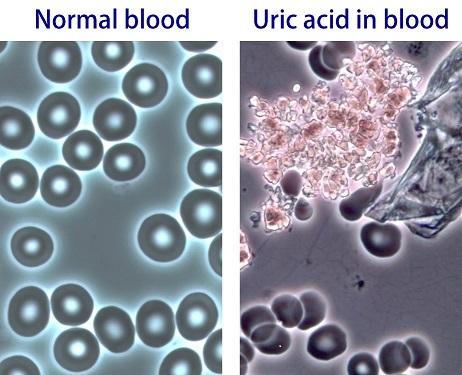 Uric acid is only slightly soluble in water and may precipitate out of solution contributing to the formation of kidney stones. Uric acid may also procure needle-like crystals in one or more joints, producing the excruciating pain of an acute gout attack. Curiously, our kidneys reclaim most of the Uric Acid filtered at the glomeruli. Why, if it can cause problems? Uric acid is a potent antioxidant and can protect cells from DNA damage. Uric acid serves as an antioxidant and helps prevent damage to our blood vessel linings. As a result, a continual supply of Uric Acid is important for protecting our blood vessels. For years we've preached about the importance of Uric Acid as an essential DNA protector. We've always feared the use of prescription drugs, such as Allopurinol, since it unnaturally attempts to suppress uric acid production altogether. Uric acid has a role in protecting DNA from single-strand breaks caused by free radicals in the body leading to a protective effect in neurodegenerative diseases. The brain is particularly vulnerable to oxidative stress as it is considered an 'expensive tissue' with a particularly high metabolic rate and comparatively increased utilization of oxygen. Brain tissue is also high in unsaturated lipids, which makes it more susceptible to free radical damage. Oxidative stress is thus linked to the pathogenesis of neurodegenerative diseases and also ischemic brain injury. While an overabundance can be dangerous in many ways, we still require proper levels of Uric Acid production. The key to success? Obtaining the right Uric Acid balance.........without dangerous prescription drugs! Gout Stage Assessment- What Stage Am I In?